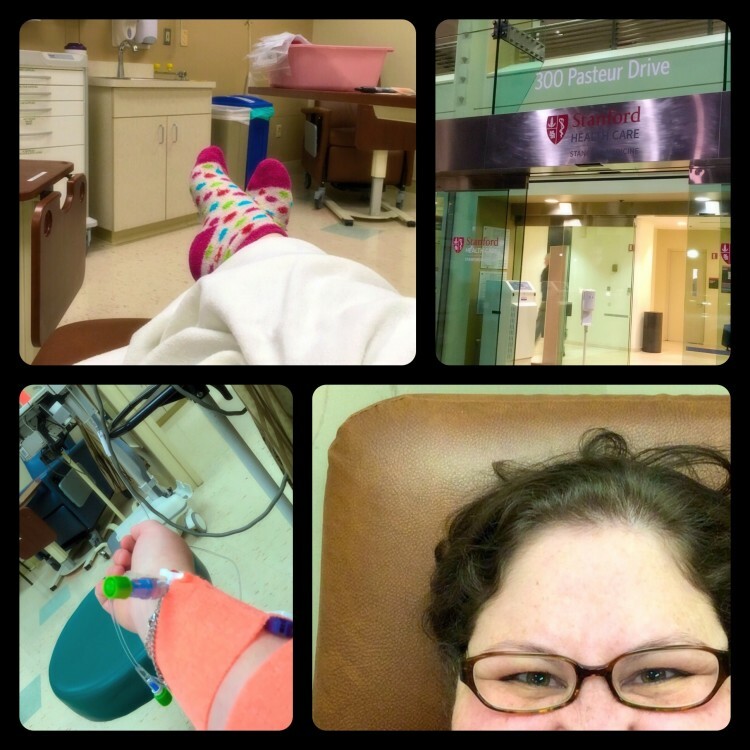 In the beginning of October, I participated in a fun-filled, five-hour excursion to the infusion room at a world-renowned university hospital. What did I do to earn this new multi-hour endurance test in a windowless room in the bowels of a building in a picturesque northern California town? Well, for starters, I’m not getting better. You would think this would be par for the course in the life of a chronically ill person that has been battling one thing or another for the past two decades, but alas, it’s not. The further down this rabbit hole I travel, the more I learn about medical tests, cutting-edge procedures and what medical professions will do when there is no clear-cut cure for the rare disease that rattles my body. It has been a year and a half since the tumor was removed from my pituitary, and yet things haven’t yet gone back to where they should be. This is my third recurrence of Cushing’s disease, and I thought I had been through all of the pokes, prods, labs and injections (not to mention neurosurgeries) that went along with the treatment of this wretched disease, but it turns out there was more to come. After my first two (also successful, I might add) surgeries, I slowly, but surely, got better. But this time, wellness eluded me. In fact, in hindsight, my health had been deteriorating for some time before my third diagnosis, and through a combination of determination, pain medication and a healthy assist from friends and family, I was able to continue living my life — albeit a pared-down version, teetering precariously on the brink of collapse. All of this brings me back to the five-hour test. It wasn’t the worst I have encountered, but it was uncomfortable and gave me plenty of time to reflect on the current state of my life. I realized that I was hoping this test would come back positive. That it would give me a reason why, a sliver of hope, a chance of some kind of recovery. It’s a strange place to be, wishing for something to be wrong with you. On its face, it reads like an act of self-sabotage. Why would I want to add another diagnosis, another lifelong medication, another bullet to the list of the ways my body has veered off course? In my experience, though, it’s sometimes harder to be in the gray space of not knowing. We don’t wish for ill health, but we hope for an answer as to why things are going awry and ultimately a plan to treat, or in many cases, manage the litany of problems that arise during chronic illness. Back in 1999, just before I was first diagnosed with Cushing’s, I was overwhelmed by so many symptoms and the constant unrelenting pain that went with it. Doctor after doctor ran tests then dismissed me from their care, referring me to entirely new specialties to begin the process of questionnaires, reciting of my health history and testing all over again. It was exhausting and scary. Something was wrong, but we didn’t have a name for it. And with no name, it was a series of shots in the dark, combatted only with medication and procedures to try to manage my pain. When a diagnosis was finally reached, my sense of relief far outweighed my fear of surgeries, hospitals and the procedures to come. That sliver of time between recovery and treating my rare disease, while challenging, is far less daunting and inspires a sense of relief. Relief in the form of knowing that there was a reason why. And that’s where I find myself now — in the purgatory between knowing and diagnosis. It’s the uncomfortable space that lies somewhere between wishing it so and dreading another label to add the list of maladies that comprise the fabric of my ill health. It’s a place that I have been to many times, but it never gets any easier there.